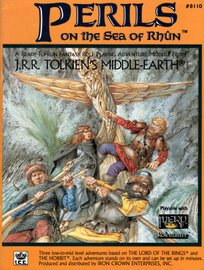 "Three low-to-mid level adventures which each stand on their own and can be set up in minutes. Death lurks in every shadow, but fame and fortune follow peril in these 3 exciting adventures!" • more than 20 barrows including the mounds of the ancient Edain Kings." • detailed barrow layouts and descriptions." "This supplement is set in the most remarkable town of southern Rhovanion. Hazard the gullies and ravines that form the streets of Strayhold, a few miles south and east of Mirkwood. Called by many names, few of which are complimentary, it is home to scores of merchants and travellers who ply the Road to Rhûn. It also harbors an unsavory lot of highwaymen, petty thieves, and beggars. 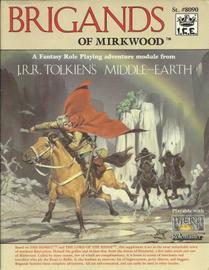 Brigands features three complete adventures. All are self-contained, and can easily be used in other locales. The settlement of Strayhold, with its rag-tag collection of buildings, has the air of a dark carnival. For first time acquaintances, its corduroy streets form an intimidating labyrinth filled with hawkers and revellers. Strayhold's shops cater to vagabonds and rogues out to spend their ill-gotten gains and to travellers looking for excitement or rare goods. All manner of goods are available within the tangled streets; the sellers vary from friendly and helpful to dangerous and deadly. Unfortunately, most of the inhabitants lean toward the latter. 3 COMPLETE ADVENTURES: The Excursion to Strayhold, Raid on the Rogue's Clan-hall, The Castle of Leärdinoth"
"DAGORLAD details the east marshes and the shadowy haunts of the sorceress, Miruimor. Adventure on the plains before the Gates of Mordor, where roaming Orcs strike terror among unwary travelers. South of the Wilderland and north of Mordor lies a widely varying landscape stretching from the scarps and cliffs of the western Emyn Muil through the swamps and marshes of Nindalf to the bare plain known as the Dagorlad (S. "Battle Plain"). Once these lands were pleasant enough, in the way of wild places, although they were never much favored by settlers. The wetlands were filled with all manner of waterfowl and alive with the songs of frogs and blackbirds. The region's waters gleamed with fish, and deer grazed the marsh grasses, bothered only by the hunting expeditions of the scattered tribes of Marshmen. These folk were almost always left alone and ignored by the wars and battles which raged about them, for their watery lands have always been too difficult for an army to cross with any speed, and treacherous indeed for those not born of the marshes. Instead, travelers have always gone by way of the broad plain before the dark gateway into Mordor. This expanse was once covered with wild grains and other grasses which quickly sprang up to hide the remains of the great war fought here at the end of the Second Age. Grouse pecked and nested there, and wild cattle grazed. Although unsettled by Men, these lands were peaceful and fruitful until a few hundred years ago, when the Shadow began to descend upon them once more. This supplement embroils adventurers in a desperate attempt to save the Beacon Towers of the Dúnedain. The last bastions of the Free Peoples in Rhudaur, these towers oppose the unscrupulous Cultirith Rangers, Orc troops, packs of Wargs, and the newly awakened horror from the Yfelwood, all now gathered by Angmar's minion - the Dark Mage. Peril, mystery and evil await the adventurous in the declining kingdom of Rhudaur. The Witch-King of Angmar is preparing to launch a new war against the Dúnedain of the North. Will you bolster the defenses of one of the threatened Beacon Towers? This is but one of the challenges. Fight barbaric Dunmen who plunder a well-travelled trade route. Confront the Yfelwood shadow, arisen from the mists of the ancient past. COMPLETE LAYOUTS AND AREA MAPS depicting adventure sites. CONCISE BACKGROUND INFORMATION on the politics and history of the Angle, the land between the Bruinen and Mitheithel Rivers. 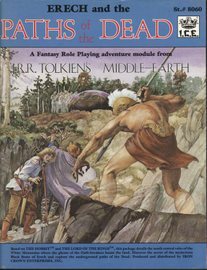 3 FULLY-DETAILED ADVENTURES: including stats and other game aids. The Necromancer's presence in Mirkwood has lengthened the shadows darkening the forest's eaves. Orcs from the Grey Mountains move south through the trees, Giant Spiders congregate in larger numbers, and Trolls emerge from their caves more frequently. Several lads and lasses of Ulgarstat, a hamlet at the forest's edge and due west of Lake-town, have disappeared without a trace. Will you risk unknown dangers to find and rescue the missing youths in Attercop Attack? A merchant based in Lake town has lost a caravan to Trolls along the Men-i-Naugrim. Will you face the dread Tereg to recover Master Eolsen's goods and discover the fate of his hirelings in Trouble With Trolls? A Beorning warrior has learned of a tithe to the Necromancer from the last of the Orcs he slew while traveling though Mirkwood. Will you accompany Grimbold into the forest to waylay the treasure before it enters the Necromancer's citadel in The Tithing Train? 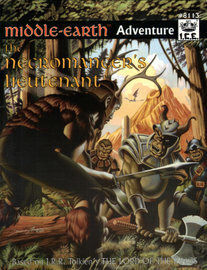 Combat Giant Spiders, Trolls, Orcs of Fhahoz-Blogrum when you attack the Denizens of the Dark Wood in these three exiting adventures. "This package details the south central vales of the White Mountains where the ghosts of the Oath-breakers haunt the land. Discover the secret of the mysterious Black Stone of Erech and explore the underground paths of the Dead. Below the towering heights of the Ered Nimrais, the White Mountains, lies the Morthond (Black-root) Vale, a rich land of rolling, fertile fields and rushing alpine streams. This was, long ago, the land of the Daen Coentis (Dn. "People of Skill"), the folk who later became known as the Dunlendings. Their tribes ranged these rich valley lands and farmed these fields, hunted the mountain forests, herded in the meadows, and mined the cliffs and gorges. The Daen Coentis were never very many, but they were skilled workers in stone and keen observers of the seasons and the night skies. They erected hundreds of massive stone observatories that served as both calendars and as temples to the Valar, whom they worshipped as gods. Their peaceful existence came to an end in the middle of the Second Age, during the Dark Years of Sauron. The devout but primitive religion of the Daen Coentis made it relatively easy for the Dark Lord to subvert the worship of these people. With the passing of years the Evil One preyed upon their superstitions." Explore the sunspeckled twilight beneath the boughs of the Forest of Tears. Amidst the songs of brilliantly feathered birds, a small people struggles with its insane gods, fighting to keep the traditions of its age-old society intact. Obsessed with secrecy, the Honnin are troubled by a cannibalistic spirit who preys on its worshippers and a Tavari seduced by Sauron's promises of power. 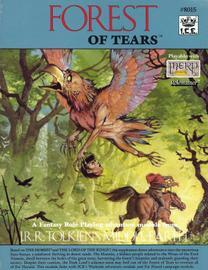 These dangers threaten visitors to the mysterious Forest of Tears. * TWO FULL-COLOR MAPS: including a regional map and a map of the nearby city of Bozisha-Dar. * THREE EXCITING ADVENTURES: confront an order of the Honnin Monks intent on guarding the secrecy of "The Hidden Shrine"; avenge the death of a Haradan youth in "The Tower of Birds"; and combat a local goddess pledged to Sauron's service in "The City of Pred". * DETAILED LAYOUTS: of all adventure sites. * STATISTICS: for Honnin priests and monks, beasts of the Suza Sumar, and one of the powerful Tavari. A shipment of wine and ale has disappeared in North Ithilien. Firichal, a wealthy wine merchant has offered a reward for information and assistance. Are you brave enough to follow the Trail of the Wine Bandits? The tower of Barad Perras once withstood the efforts of besieging Orcs. Years later it was abandoned and forgotten... Recently, however, a band of Scara-hai Orcs has claimed the tower as a base from which to terrorize the area. 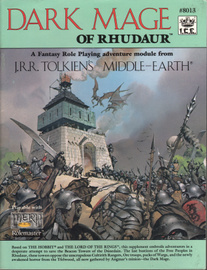 Are you willing to face The Trouble at Littlehorn? The people of Minas Tirith speak of a strange band of Orcs and their sorcerous leader Gaurhîr. These Scara-hai have been bred for very special plans, plans about to come to their gruesome fruition. Do you have the courage to face The Master of Durthang? Danger is everywhere, but so are the rewards in these 3 exciting adventures!" "Four low-to-mid level adventures which each stand on their own and can be set up in minutes. Bar-en-Tinnen is a sleepy little town on the banks of the mighty Anduin river. But now the complacent inhabitants must keep their eyes open. A ghost haunts the river on foggy nights; the wise bar their doors at sundown. Can you unlock the mystery of The Ghost on the River? The haunted riverfront is not the most terrifying of recent events. A young lad, panic stricken, dripping wet, and shivering, collapses on the doorstep of the Fen Worm's Fire Inn, a broken arrow shaft protruding from his left arm. Will you help defeat his enemies in The Survivor? 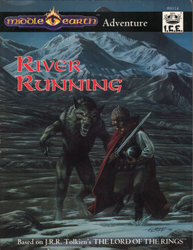 The tailor's son disappears after encountering the river ghost and telling the story far and wide. 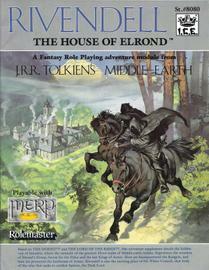 Will you face the darkest evil to search for the young man in The Edain-in-Arthedur? Despite plentiful rainfall, the trees and crops are withering. A supernatural blight has struck the land. Are you resourceful enough to combat The Shadow on the Banks? 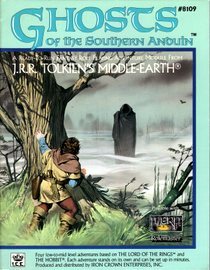 Confront bandits, undead, evil priests, and minions of Sauron as you hunt the Ghosts of the Southern Anduin in these four exciting adventures!" "Dunland, or Dunfearan, as the region is called by its inhabitants, lies among the rugged western foothills of the southern Misty Mountains. The Great Plague swept these highlands in T.A. 1636, but now a worse evil scourges the Dunmen. 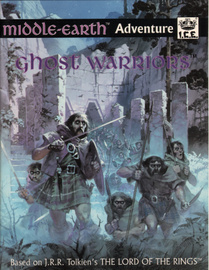 Ghost Warriors roam by night, taking captives to swell their Undead ranks. The key to their defeat lies beyond Riddle Caves, the mysterious entrance to a dark labyrinth that twists through the roots of the mountains. 11" x 17" FULL-COLOR MAP depicting the terrain of Dunland. 3 EXCITING ADVENTURES involving a clash with Dunnish Wights, a battle against a powerful shaman, and a risky venture into the Under-deeps that sprawl beneath the mountains. DETAILED LAYOUTS of adventures sites including the Riddle Caves, the Path of Riddles, and the Ghost-caves. GAME STATISTICS of the Beasts, Undead, and NPCs that dwell in the hills of Dunfearan. RANDOM CAVERN GENERATION SYSTEM provided for travel through the Under-deeps, the vast network of caverns that twists below the surface of Endor." "This package details the High Pass of the Misty Mountains. 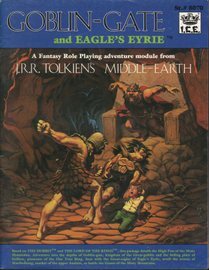 Adventure into the depths of Goblin-gate, kingdom of the Great-goblin and the hiding place of Gollum, possessor of the One True Ring. Soar with the Great-eagles of Eagle's Eyrie, stroll the streets of Maethelburg, market of the upper Anduin, or battle Giants of the Misty Mountains. Cutting through the heart of the Misty Mountains is the High Pass, connecting Rivendell and Rhudaur to the ancient Dwarf-road running east through the dreadful forest of Mirkwood. Near the summit, Orcs have delved one of their infamous subterranean strongholds, known to its apprehensive neighbors as Goblin-gate. The strategic locale of Goblin-gate is an incalculable threat to the Free Peoples because of its proximity to Angmar and the Orcish capital of Mount Gundabad." 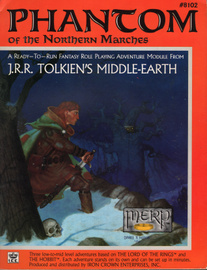 1st edition (1985) has a magenta/rose themed cover. 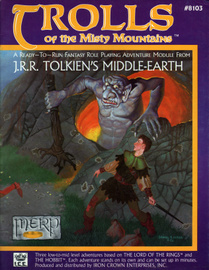 2nd edition has a lavender cover. There are no significant internal differences to my knowledge. Sixteen merchants have died on the treacherous road between the towns of Cabed Angren and Sarn Erech. Forlong, a wealthy landowner, believes that bandits are behind the killings and has offered a rich reward for their extermination. Are you cunning enough to unravel the mystery surrounding The Lonely Tower? Setmaenen, an abandoned calendar-temple of the ancient Daen Coentis, harbors a king's fortune in jewels and treasures. But the holy place is protected by powerful wards and traps, guarded by ghosts, and tainted by a cursed artifact of the Dark Lord. Can you defeat the supernatural forces that lurk among The Seven Stones? Only Tarien, Lady of a wealthy Dúnadan family, escaped with her infant grandson when Dunnish warriors attacked her rural home. Her son, Derovin, was captured and taken to the haunted butte called Hogo Tarosvan. The Lady seeks revenge and the safe return of her son. Have you courage enough to search beyond The Phantom Doors? 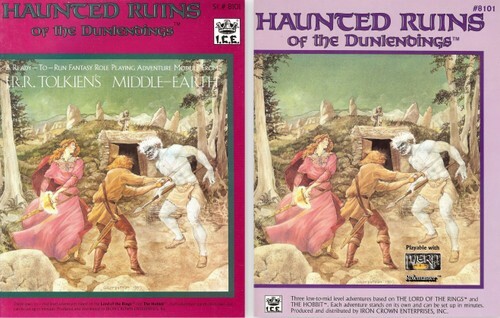 Peril lurks among the Dunnish ruins, but glory and wealth follow danger in these 3 exciting adventures!" Secrets lurk within Far Harad's Vale of Tears, mysteries that remain hidden for centuries. For the rural folk who dwell in the scrublands at the forest's edge, these enigmas can spell misfortune... or disaster. The lush beauty of Suza Sumar unveils forgotten horrors all too often. * Inexplicable floating points of luminescence plague the village of Avashar. Can you discover the secret behind The Lights of Avashar? * Barthanan, a shepherd dwelling in the Scrublands, is losing sheep from his flock. No predators or signs of a struggle have been spotted. Can you solve the mystery of The Disappearing Flock? * Janir, a trapper who frequents the Suza Sumar, falls victim to nightmares after stumbling across a ruined keep. Will you risk insanity to stop a Demon's triumph in The Terror in the Jungle? * Manari Akajhi, a young scholar, is tracing his family's lineage in search of a suitable resting place for his dead father. Unfortunately, his newly discovered heritage has drawn the powerful Storm King's attention. Will you oppose the Nazgûl to prevent his capture in The Eyes of the Dragon? 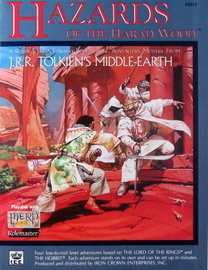 Confront Wild Men, Baricha, Demons, and Desert Screamers when you face the Hazards of the Harad Wood in these four exciting adventures." "HILLMEN of the Trollshaws details the lands of western RHUDAUR. 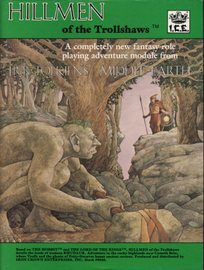 Adventure in the rocky highlands near Cameth Brin, where Trolls and the ghosts of Petty-Dwarves haunt ancient caverns." "This supplement details the wild delta that dominates eastern Rohan. In this marsh the Entwash meets the mighty Anduin river, and unwary travellers encounter unexpected dangers. 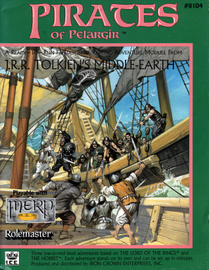 This module features 3 complete adventures. All are self-contained and can easily be used in other locales. 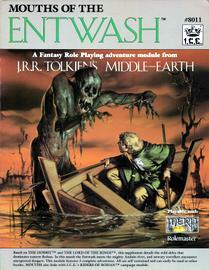 Delve into the swampy forests surrounding the treacherous MOUTHS OF THE ENTWASH! For almost two hundred miles the southern channel of the river winds through bog, marsh, fen and breckland, continually splitting and rejoining itself. Here you'll find a host of peculiar creatures and foul denizens - including the hideous undead known as Mewlips. This module contains the history of the places, people, creatures, and treasures found in the region, together with 3 exciting adventures, each of which can be set up in only minutes. 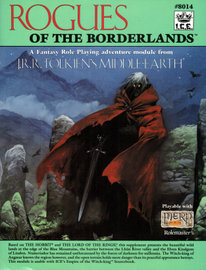 3 COMPLETE ADVENTURES: smuggler's intrigue in "The Water of Life"; a murder mystery entitled "Micandor's Tower"; and a horror tale called "The Lost Ring"
STATISTICS: for all of the garrisons, NPC's, beasts, and monsters"
"Strange portents in the great Seeing-stone of Minas Tirith give promise that one of the lost palantiri of the North has returned to the lands of Men. Can the adventurers find this legendary treasure and bring it to King Elessar? Rogues of the wilds, blizzards out of the Forodwaith, and the greed in Men's hearts all conspire against them. 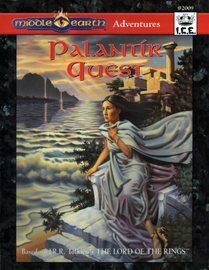 Palantir Quest contains an extended series of adventures — a campaign — that culminate m a perilous confrontation with a subtle and deadly foe of the Reunited Kingdoms. 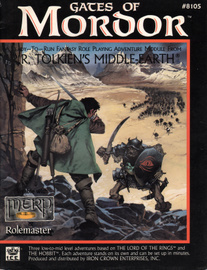 It's perfect for players moving up from LOR to MERP. The quest is also suitable for the experienced GM who wants exciting, detailed, linked scenarios that require no extra set-up work from him or her. 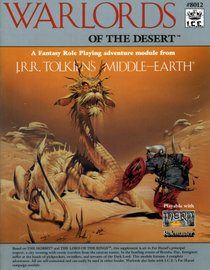 All the NPCs and sites involved are fully described, and the course of the adventure is completely charted. • THE HEROIC SEARCH for a palantir of the North, a quest which takes our bold adventurers from the splendor of Fourth Age Minas Tirith to the frozen expanses of Forodwaith to the tangled glades of Greenwood the Great. • HISTORY OF THE SEEING-STONES from their creation in the West to their final fate in the Middle Lands. 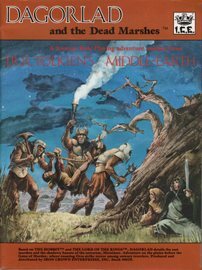 • TRAVEL NARRATIVE — for the GM to read aloud to the players — describing in brilliant detail the sights seen by adventurers on their journeys across Endor. • FOES who march to the tune of a subtle adversary: their stats, motivations, and tactical methods. • ALLIES bound to succor the PCs out of loyalty to King Elessar. • ADVENTURE SITES where treasure, secrets, and dangers abide — including the ruins of Annuminas, a sacred refuge of the Lossoth, the bunal chamber of a forgotten King, and a smuggler's Lake-town hide away." The renowned vessel, Ocean Noise is embarking on her last run of the season across the Sea of Rhûn. The captain has hired three new crew members for his aging ship. All are well-seasoned, but the winter is fierce, and evil is in the wind. Will you be aboard to witness a Murder on the High Seas? A kidnapper abducts Princess Herufara and sails to a ruined tower above the cliffs of a treacherous shore. The Ocean Noise pursues the villains, but can drop anchor for only a day. At next tide, the captain must abandon the chase and continue his voyage. Are you daring enough To Rescue A Princess? A Court Adept is tormented by dark visions off ill-doing, and departs the palace in search of their meaning - but his found brutally murdered! The Realm-master sends adventures and a princess on the Ocean Noise to consult the mages at an ancient tower. On this long, cold journey to a desolate shore, can you uncover the secret of The Watch Tower Massacre? 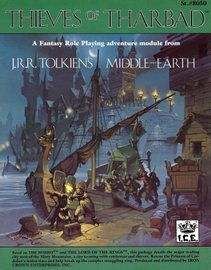 Face assassins, the Cult of the Long Night, and Sauron's minions as you brave the Perils on the Sea of Rhûn in these 3 exciting adventures!" A huge firedrake has crawled out of the shadows of the northern Misty Mountains. His path of fiery destruction leads to the Witbeamwyd and the town hall where he lies unchallenged. Can you match the massive strength and hot breath of Gerse's Bane?" At an Inn called the Tipsy Triton you listen intently as a sea captain tells of pirate raids off the Red Cliff Coast. He needs strong-hearted mates to sign on for the voyage. Dare you sail with the master of The Lady Gilwen? Pirate raids have pushed the local merchants to their limit. A reward is offered for the discovery of the Laughing Raider's hiding place. Will you take up the Search for the Raider's Harbor? The fair Dorien is being held captive by blood-thirsty pirates. She will soon be sold into slavery. Who will stage a raid into the pirate's stronghold to rescue her? The risks are great, but so are the rewards in these 3 exciting adventures! Dorwinion, the Land of Maidens, flanks the eastern end of the River Running where it flows into the Sea of Rhûn. Inhabited by traders and diplomats, the realm is famed for its magnificent wines. Casks of sparkling whites, subtle reds, and sweet rosés travel to all ends of Middle-earth. 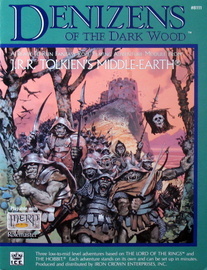 Despite its location on the frontiers of Gondor, Dorwinion is not ignored by the dreaded Necromancer who lurks in Mirkwood. Monstrous beasts, sorcerous raids, and supernatural diseases all plague the Dorwinadan peoples at the Dark Lord's whim. 6 CHALLENGING ADVENTURES in which the Dark Lord's minions strive to bring ruin to Dorwinion and all who travel the River Running. COMPLETE LAYOUTS & MAPS for each adventure - more than 12 pages in all. STATISTICS for all beasts, monster, and NPCs that confront the adventurers. TABLES of results and NPC reactions for all adventures. EXTENSIVE GM NOTES for exciting, well-run play. REWARDS - for successful adventurers described in detail - including the coveted license to export Dorwinion wine. This supplement presents the beautiful wild lands at the edge of the Blue Mountains, the barrier between the Lhûn River valley and the Elven Kingdom of Lindon. Numeriador has remained unthreatened by the forces of darkness for millennia. The Witch-king of Angmar knows the region however, and the open terrain holds more danger than its peaceful appearance betrays. Meet intrepid rivermen, banished Dúnedain, reclusive Elves, and the shrewd Dwarves of the Nan-i-Naugrim while roaming Numeriador's untouched scenery. Roaring waterfalls, snow-capped peaks, and deep forest whose shadows hold beasts and monsters surround the isolated hamlets and farmsteads where only the fearless and hardy dare dwell. 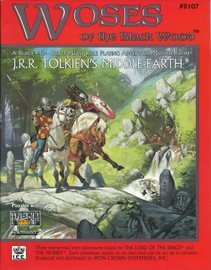 Far from the comforts of civilization, travelers face marauding bandits, hungry Trolls, and the spies of the Witch-king throughout this frontier. 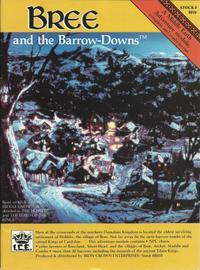 THREE EXCITING ADVENTURES: seek legendary gold and the mystery behind a cabin haunt in "The Legend of the Ice Caves"; capture the pranksters whose jokes are lethal rather than funny in "No Sense of Humor"; and discover the sinister secret behind the animated corpse that walks "The Celeglin Barrows"
This product details the major trading city west of the Misty Mountains, a city teeming with cutthroats and thieves. Rescue the Princess of Cardolan's stolen tiara and help break up the complex smuggling ring. Tharbad was founded in the Second Age by Tar-Aldarion as an inland port for his fleet to use while exploring the interior of Middle-earth... Its broad avenues, public parks and well laid out streets were the envy of other northern cities, for Tharbad was built by the Numenorians at the height of their power. However the years have not been kind to Tharbad... Although much grandeur remains, most sections of the city have fallen into decay. Minas Ithil rests beneath the rising moon, serenely unaware of the terrors stirring in the nearby Mountains of Shadow. Travellers entering the Ithil Vale in 1640 of the Third Age behold the luminous marble walls and slender tower of this famed metropolis, the spire reflecting moonbeams that illuminate the vale with a haunting ethereal glow. Here, across the white bridge of the Ithilduin and between the flowering meadows on either bank, evening splendors beckon: thousands of flickering lanterns promise safety and rest for the weary wayfarer. In Minas Ithil men are immersed in the memories of their former glory, for now - since the Great Plague of four years ago - many of the city's mansions are tenanted by none save ghosts. Yet none foresee that this place of beauty is fated to become Minas Morgul, dread city of the undead and the fearsome domain of the Nazgûl. The dangers are growing daily. Turning from the white bridge over the Ithilduin, one ascends a path on the northern side of the vale. Soon he reaches a series of stairs climbing into the Mountains of Shadow, and beyond that comes to a pass whose very name connotes an age-old evil: Cirith Ungol, the Spider's Cleft. 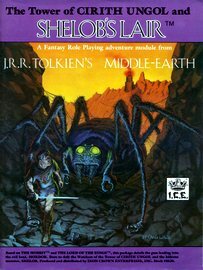 Within a reeking, dark tunnel at the summit of the pass lurks a primeval monstrosity, the devourer of Men and Elves - Shelob, the Greatest of the Great Spiders. Beyond Shelob's lair the weird and desolate landscape of Mordor, Sauron's ancient domain, stands stark and ugly as a vast scar. Once the troops of Gondor warded this land against evil, but since the Plague the watch has been abandoned. Now only a skeletal Gondorian garrison remains to hold the formidable Tower of Cirith Ungol, which commands the westward passes from Mordor. In these days of Gondor's decline, Orcs, Trolls, and other creatures of Darkness dare to roam within sight of the Tower's walls. On one side of the bridge Minas Ithil stands tall and proud, offering refuge and pleasures. On the other side lie the perils of Cirith Ungol and Mordor, where the valiant and skillful may win renown - or lose their lives trying! Here civilization and wilderness converge, and adventures are but a stone's throw away. The southern edge of the East-wood is no longer peaceful. Marauding Trolls have brought unrelenting terror to the area. A small community of Dwarves has been wiped out ... eaten. Are you stalwart enough to face the intruders in the Adventure at Duildin Hill? Two border keeps sit isolated in this area of the East-wood. The proposed path between these strongholds passes through Orc and Troll infested territory. Can you survive the Adventures at the Village of Garkash? Well concealed within the East-wood lies a dangerous gorge. Rumors have placed an ancient and powerful artifact within this pit. Many have preceded you in search of the heirloom. Will you risk the Adventure of Maes Fao?" 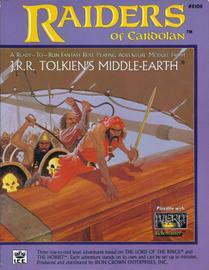 "This supplement is set in Far Harad's principal seaport, a city teeming with exotic travelers from caravan routes. In the bustling streets of Bozisha-Dar, foreigners suffer at the hands of pickpockets, swindlers, and servants of the Dark Lord. 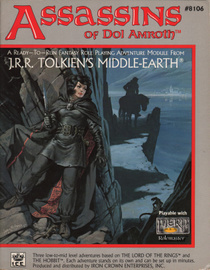 This module features 3 complete adventures. All are self-contained and can easily be used in other locales. Visit the great cosmopolitan port called the Dar, the jewel of Far Harad. In the Sevet Kovina, the Festival Quarter, traders and rouges from dozens of lands jostle shoulders amidst the revelry. In the Seller's Court spices and silk vie with ivory and animal pelts from Mûmakan for the bargainer's eye. Anything can be bought - for a price! And on the Katedrala, the hill where the mansions of the wealthy stand beneath lush palms, dark schemes and political intrigue seethe among the nobility. Within one ornate palace lurks evidence of the Nazgûl's plan to seize the city. 3 EXCITING ADVENTURES: a confrontation with thieves in "The Tangled Streets of Bozisha-Dar," a risky rescue attempt in "Bandits of the Eastern Hills," and political intrigue in "Southern Hospitality"
STATISTICS: for Far Haradan warriors, NPCs, beasts, and monsters"
Over the years, the people of Bor Leath have experienced perils that would daunt the hardiest. Now, a new terror walks the night. Can you put a stop to The Haunting of Bor Leath? Ten miles to the north of Bor Leath lies the home of Coel, the herb mistress. She has befriended the local animals who shield her from the dangers of the Black Wood. What will you encounter in the Adventures Around the Cabden? The Woses make good use of the extensive grottos that delve deep into the Bare Hills. They carefully guard the halls and treasures, reminders of past prosperity. Are you willing to face the Darkwood Woses? The promise of riches calls, but danger walks throughout these 3 exciting adventures!